Welcome to My Kris Draper Page. 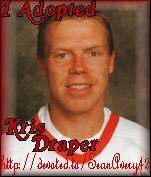 After this past 2002 Stanley Cup Finals, I decided that it was time for somebody to do a page for this hard working player and my favorite Red Wings, Kris Draper. You will find all kinds of information about him and also, my personal pictures as well as my friends pictures. If you want to know a little bit more about me, just click to the link below and you will learn about the web master of this page. Also, if you want to contribute to my site by sending me pictures, stories or encounters, please do not hesitate. I tried to find a fan page on Kris but never found one. I know there is a lot of fans all over and I thought it would be cool for him to have a page dedicated for him.